If you’ve been following along, you know that we just got back from Arizona and are still reeling from the beauty of the Sonoran desert and all the great food we ate in Scottsdale and Phoenix. One of the must eat dishes on our list was Roaring Fork’s Green Chile Macaroni. After trying for two nights, without avail, to get into the packed restaurant, we managed to slide in on the third afternoon just as the bar was opening at 4:30. We took a table on the patio and shared this most delicious Mac & Cheese. It was well worth the wait. I determined on the spot to recreate the dish as soon as I got back to the LunaCafe OtherWorldly Kitchen. I created this sauce as a green chile flavor element for the Green Chile Mac & Cheese Throw Down (which will post next) and then got to thinking how useful it would be in a good number of other dishes. For instance, it would be dynamite served with grilled fish or chicken or as an adjunct to enchiladas. It could also be used as a base for a silky soup, either hot or cold. I’d love to see it spiked with lime and served as a kind of Mexican Green Gazpacho. A creamy, silky sauce with a perfect balance of fiery heat, rich creaminess, and acidic and herbaceous counterpoints. In a medium saucepan, heat the cream and add the chiles, tomatillo, and garlic. Simmer gently for 2-4 minutes and then remove from the heat. Let cool. Using a blender, pour the cream and chile mixture into the container and liquefy. Add the green onion and liquefy. Pour the crema through a single mesh strainer to remove any remaining coarse particles. The crema should be very smooth. 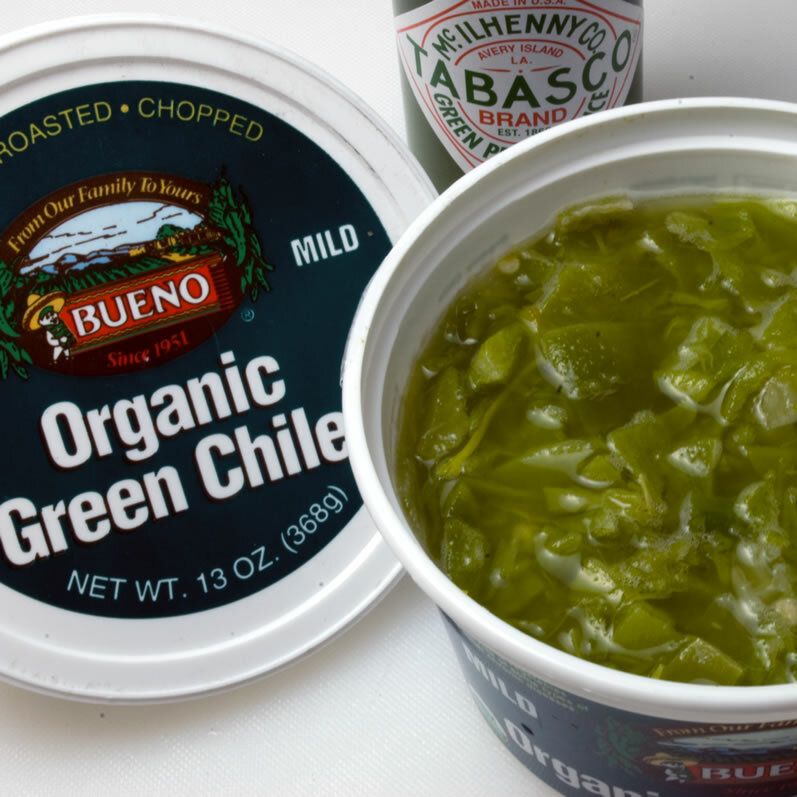 just a helpful hint for those of us expats in the north east that can only get green chiles of the canned variety–I made this the first time and didn’t strain the liquid out, ended up with a still delicious, but not so creamy result. This time I strained those babies like the life of my mac and cheese depended on it and got a full cup and a half of liquid out! Tell me that doesn’t make a difference in the end result! I want to try this a second time but ask just to be sure….FOR THANKSGIVING dinner btw!! eek! Is the garnish (red, orange, and green poblano or anaheim) to be added into the cream sauce after you’ve made the green chile crema? Or do you use it as a true garnish and put it on top of the casserole before it’s baked? I’m confused! help! P.S. I have made this before and just diced these and added them into the saute for the sauce, but then they are not truly being used as a “garnish”. This dish is great, it has become a staple in my house. Making it today as a side for bbq ribs and pork. This dish is insanely delicious. I want your cookbook now! yu-MI! This dish is insanely delicious. I want your cookbook! Well we ended up taking a spontaneous trip to Las Cruces, NM last weekend…so I didn’t get to make it BUT I am making it right now. I think your idea for adding additional chopped green chile to the sauce would be perfect! I ended up using freshly roasted hatch green chile and after I was done washing & peeling it, there was a little “chile water” left in the bowl I had the chiles in. I ended up adding that the the cream sauce (I skipped the pureeing step). I also added a half teaspoon of chicken bullion granules to the sauce. I got this idea from the traditional enchilada casserole so many of us New Mexicans like to make. The enchilada casserole uses cream of mushroom or cream of chicken soup. The mac n cheese is currently in the oven but I tasted a little bit to make sure the sauce & cheese were good. All I have to say is…it’s going to be VERY good. For anyone who’s a vegetarian, instead of using the chicken stock/flavor, you could easily add a little vegetable stock (perhaps use 1/2 cup and reduce the amount of cream). I cannot wait until it’s done! 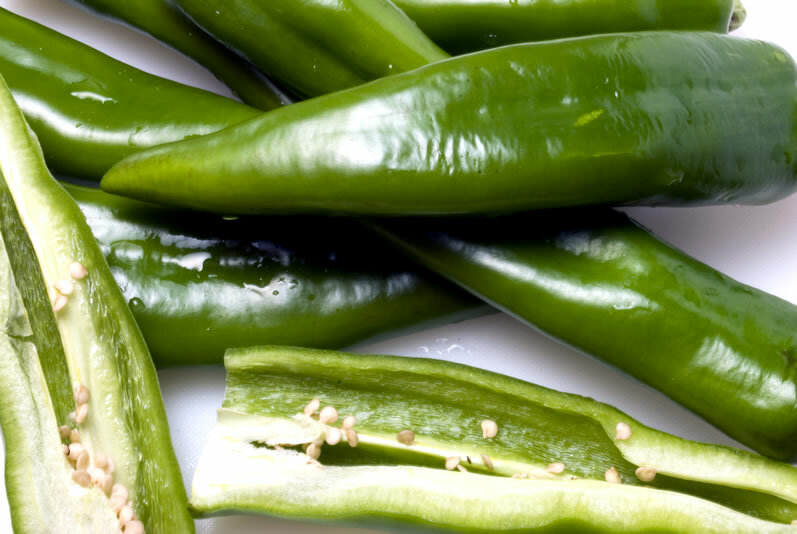 You need to use freshly roasted Hatch, New Mexico green chili…. end of September is our chile season! The whole state of NM smells delicious! Deep thinking – adds a new disimneon to it all. Chile season starts in early August. First week of August this year there were vendors and roasters set up in all the usual places in Santa Fe. LOL – yep! You can’t go to a grocery store around here at this time of year w/o that aroma. There’s just nothing like it! I also love seeing the huge burlap sacks of green chile inside the grocery stores and outside at the vendors. If I had the time and freezer space, I would buy one of those huge bags, get it roasted & freeze it as a stockpile. But, alas…no time or space! I’ve found a decent substitute though. The Costco’s in Albuquerque carry frozen green chile. The best form is a pack of 12 individual green chile packets. Each packet is 7 oz. I usually defrost by submersing a packet in warm water. They’re the perfect size for every day use. One is enough for a couple of omelets or to top 4 cheeseburgers. Can’t get more convenient than that. My goal is to try the green chile mac & cheese recipe this weekend. I have a feeling I’ll be putting my own spin on it since I prefer diced green chile in things (modifying the crema recipe – no liquefying I don’t think). Stephanie, I’ll check the Costco here. Would be great to have a backup supply. How did your Mac & Cheese turn out? Perhaps do liquefy the sauce so that the chil color and flavor are pervasive and then add additional chopped chilies. Oh yum! Wait, I cannot fathom it being so stawightforrard. Just got back from AZ and was craving this exact dish. Did a google search and this site popped up. Psyched to try it!! Great site. I cannot wait to make this. 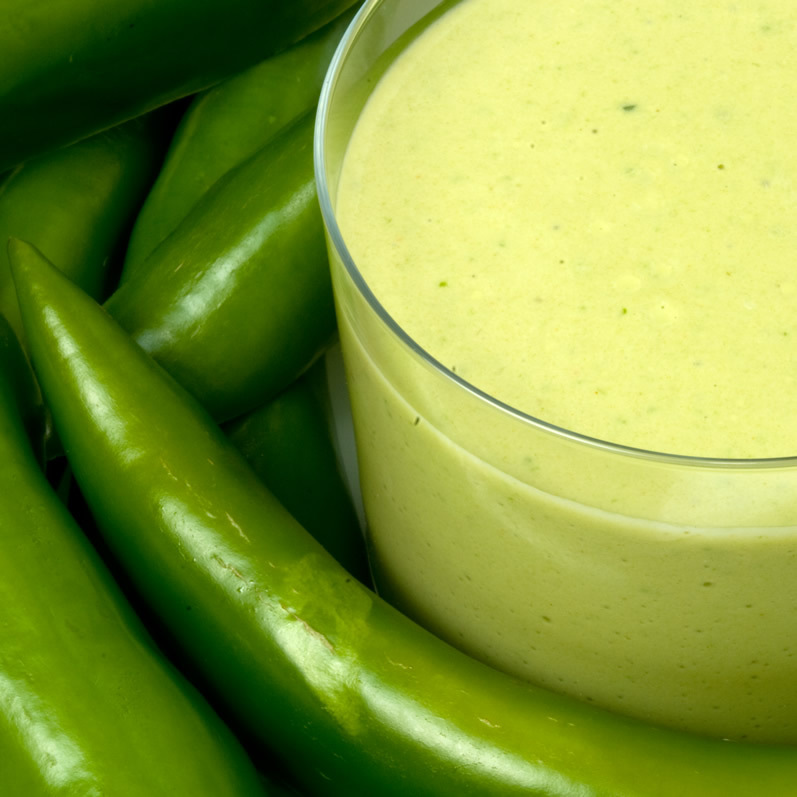 I can see it as the sauce for my green chile enchiladas. Also am anxious to make the chile mac and cheese. I always have chile in my freezer. Every summer end we buy a tow sack of green chile. Roasted and waiting on me to peel and seed it before putting in the freezer. I also make a lot of rellenos that we really love. Mostly I put half a dozen chiles in a freezer bag, but we also freeze it on a cookie sheet and then I fill gallon bags. In a pinch I can go grab these individual chiles and use right away. Sorry, didn’t mean to go on so much. Wow, nmsusieg, can I come over to your house for dinner? 🙂 It’s a great idea to freeze a good supply of chiles while they are plentiful and affordable. At the Portland Farmers Market in late summer there is a fellow with a huge gas-fired chile roaster. The aroma is amazing. It didn’t occur to me to buy a boatload and freeze them. Next year! P.S. Yes, this sauce will be awesome on your enchiladas. as nmsusieq, pointed out, it’s great to buy a bunch of chile and freeze them however, when I’ve done it in the past, I never bother to seed or peel prior to freezing. It’s actually easier to peel the roasted chiles after they’ve been defrosted (a friend taught me that trick many years ago). I wish I had the freezer space for a sack of green chile. Nothing’s as good as the roasted chile you get from the vendors. Stephanie, thanks for the tip! I made this Mac and Cheese and really the only thing I changed was adding some serrano peppers for more heat. It was AWESOME! Thanks so much for the recipe!!! I’m glad I am full as I look at these gorgeous pictures! Dang girl, you are good!I have got to make this dish and try to lighten it up a bit. Good luck, huh? Thanks Dana! Did I mention that I developed recipes for years for Cooking Light magazine? But I still prefer cream. 🙂 You can of course make a roux here and then use stock or milk as the liquid. That will cut down the fat content considerably. Oh my, this looks right up my alley! I can’t WAIT to make this! A frig full of Hummus AND Mac & Cheese! Does it get better than this?